This is what many historians say when asked about the best approaches to teaching the subject: ‘There is no one way’; ‘First and foremost, variety is best’. 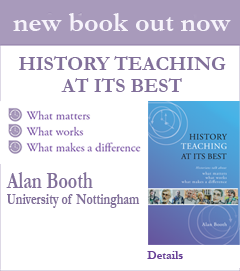 So, there is no secret formula for successful history teaching; the best history teaching involves not a set of universally applicable rules but the recognition that teaching demands highly contextualised judgement. This view is enshrined in the UK History Benchmark Statement which sets out the framework for single honours degree programmes. In many ways I’m a fan of this permissive view of history pedagogy – the ‘let a thousand flowers bloom’ approach appeals to my sense of the need for experimentation and the need to teach flexibly: tailoring strategies according to, for example, student experience and levels of understanding; topics and themes; departmental/institutional imperatives. Flexibility is good. But it has also created challenges for us: in attempting to articulate curricular coherence and progression in simple terms; in spelling out clearly our pedagogic principles. It can sound evasive to those outside the discipline – or even worse. And there are dangers to us in not having to reflect more carefully on what we’re trying to do; a traditional lack of self-reflection has not stood us in good stead in the assault of the ‘standards agenda’. So, if we all agree there is no ‘right’ way, what are the core principles that lie beneath what we do in our curricula and classes? Perhaps we could never agree on this, after all we thrive on contestation, but at least we might debate these issues more than we do, and in a more evidenced way. As a starter in this conversation perhaps we could begin by discussing/debating 1) what is absolutely essential in a higher education in history, and 2) what we mean by higher learning in the subject. And I think we might find more commonalities than we think in terms, for example, of impact on students’ learning and lives. Perhaps, without getting too excited by the possibility, we could find within our varied approaches a pedagogy that offers maximum possibilities for personal (and social?) transformation.